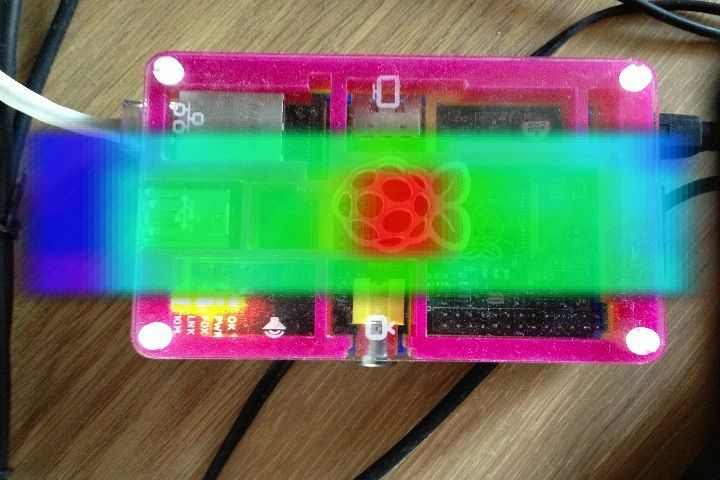 For those that missed it RHWorkshop started a Kickstarter project back in December 2012; to build an Open Source, Cheap and Affordable Thermal Imaging Camera, for use with Apple IOS or Android devices. Thermal Imaging Cameras typically cost approximately $1,500USD, this device costs $160USD (just over 10% of the value, compared to a professional piece of kit). 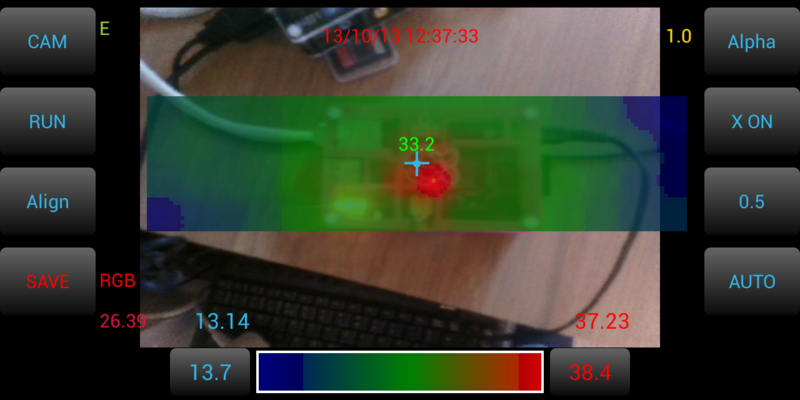 The main topic photo above is the first object I snapped with the newly assembled camera; A thermal image of the Raspberry Pi. You can see the Processor glowing red at approximately 33°C. The alignment is a little off at the moment, I just could not wait to test this little device out; Now I’m busy getting familiar with the application controls, and settings and correcting the alignment problem from my eager first photo. 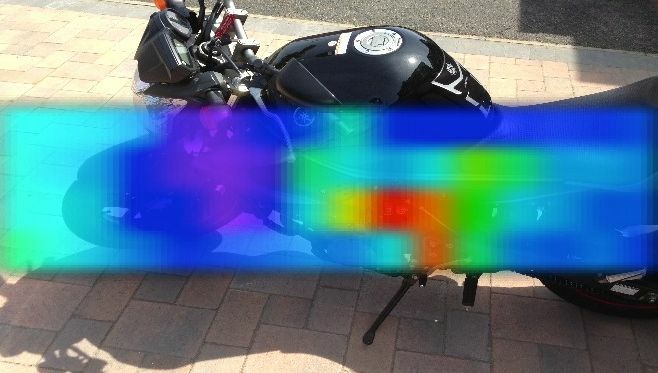 The IR-Blue lets you see the temperature of things around you. 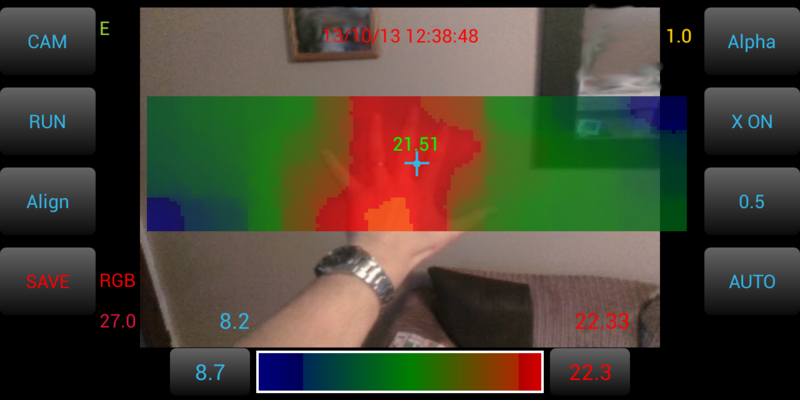 It uses a 64 zone non-contact InfraRed sensor array to read the temperature of what you are viewing. 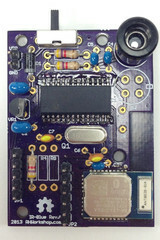 The IR-Blue connects using Bluetooth to your iPhone or Android device to show the temperature readings as colors on the screen. The IR-Blue supports Bluetooth 2 and Bluetooth 4 BLE. It works with the iPhone 4S, 5, the New iPad’s and the 5th gen iPod Touch. It also works with Android 2.3 and newer devices with at least 480 x 800 resolution displays. Thank you Andy Rawson for this affordable device. You cannot see a lot of difference with the Pi pics, but you can see a difference on my hand; one pic you can clearly see it outlining my fingers, as opposed to the other where my hand is one big heat blob.